L’ingénierie métabolique des glycanes vise l’incorporation d’analogues d’oses dans les glycanes cellulaires. Les sept analogues de GalNAc testés dans cette étude sont intégrés dans les glycanes complexes comme des antigènes tumoraux et peuvent ainsi servir à développer des nouvelles cibles pour une immunothérapie des adénocarcinomes. Pouilly, S., Piller, V. and Piller, F.
GalNAc is the initial sugar of mucin-type O-glycans, and is a component of several tumor antigens. The aim of this work was to determine whether synthetic GalNAc analogs could be taken up from the medium and incorporated into complex cellular O-glycans. The cell line employed was CHO ldlD, which can only use GalNAc and Gal present in the medium for the synthesis of its glycans. All GalNAc analogs with modified N-acyl groups (N-formyl, N-propionyl, N-glycolyl, N-azidoacetyl, N-bromoacetyl, and N-chloroacetyl) were incorporated into cellular O-glycans, although to different extents. The GalNAc analogs linked to Ser or Thr could be extended by the β3-galactosyltransferase glycoprotein-N-acetylgalactosamine 3β-galactosyl transferase 1 in vitro and in vivo and by α6-sialyltransferase α-N-acetylgalactosaminide-α-2,6-sialyltransferase 1. At the surface of CHO ldlD cells, all analogs were incorporated into sialylated O-glycan structures like those present on wild-type CHO cells, indicating that the GalNAc analogs do not change the overall structure of core-1 O-glycans. 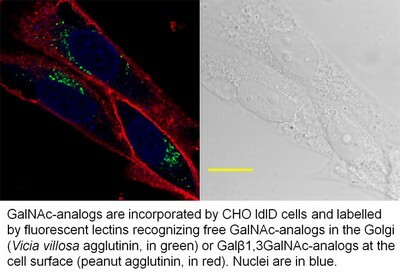 In addition, this study shows that the unnatural synthetic GalNAc analogs can be incorporated into human tumor cells, and that a tumor antigen modified by an analog can be readily detected by a specific antiserum. GalNAc analogs are therefore potential targets for tumor immunotherapy.